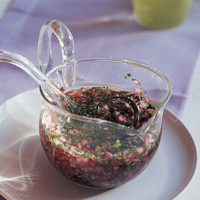 Home-made mint sauce is an unbeatable partner for roast spring lamb. It's very simple to make and can be prepared 2-3 hours before serving. In a small bowl, mix together 75ml red wine vinegar, 25g caster sugar and a pinch of salt. Finely chop the leaves of 2 x 20g packs fresh mint and 1 small red onion, then stir into the vinegar. Chill until ready to serve. Try adding chopped cornichons or small capers to the fresh mint sauce for a change.